SPIERSedit supports a form of ‘spline’ object (technically Catmull-Rom splines) which it calls ‘curves’; these are curved lines defined with a series of points (‘nodes’) through which they pass. Curves can be closed into loops, and these loops can be filled. They can be used to form objects in reconstructions by assigning them to a segment, or kept invisible in final models and used instead to create masks. Curves can be copied between slices in the same way as masks, and an interpolation system allows them to gradually change over a series of slices. Curves rendered directly as objects (i.e. assigned to a segment) can be used to bring out impersistent or thin linear structures, or as closed and filled loops to define regions that cannot easily be edited out. Curves used as a basis for masks, particularly when used with interpolation, provide an invaluable tool for rapidly masking datasets. They also greatly aid the consistent definition of arbitrary boundaries, as these can be defined as straight lines or gentle curves, making the nature obvious, and neater than drawing such edges in by hand. Curves are visible in all modes if assigned to a segment, but unless SPIERSedit is in Curve mode they will just appear like normal pixels of whatever segment they are assigned to. When SPIERSedit is in curve mode, all curves present on a slice will be visible (in their specified colour) if assigned to a segment; curves not assigned to a segment are only visible if selected in the Curves panel. Points controlling a curve are only visible if the curve is selected. Each curve can only appear once on any one slice. If more than one curve is needed on one slice then multiple curves must be created. The same curve can be used to model different objects as long as they never don’t appear on the same slice, but it is better practice to create a new curve for each new object. If a large number of curves are used it can become difficult to keep track of them; the Grey-out curves not on current slices command on the Curves menu is provided as an aid to identifying curves active in the part of the dataset under inspection. Unlike all other data editing on a per-slice basis, curves are not stored in separate files but within the .spe file. If many curves are being used it is hence recommended that the user increases the autosave frequency (see Advanced Prefs) or manually saves more regularly. There is no maximum number of curves. Curves are listed in the Curves panel (Fig. 17), which works in a very similar way to the Masks panel. Creating curves: Curves are created using the New button on the Curves panel. New curves are given a unique name and colour; by default they are open and not assigned to a segment. A newly created curve contains no points; before anything is visible the user needs to create nodes on slices for the curve. Curve Name: This column provides a reference name for the curve. Edit by double-clicking. Col: The curve colour (only displayed in curve mode). Edit by double-clicking. ‘Loop’ icon: This specifies the mode of the curve; curves can be open (a line), closed (an unfilled loop), or filled (a filled loop) (see Fig 18). Double-click to cycle between these three modes. Segment: The segment the curve is assigned to, or [None] if not assigned. Double click to edit. Slices: [Added v2.14, not shown in Fig 17] – gives the flrst and last slice on which the curve is used, or ‘Not Used’ if not currently active on any slice. Selecting curves: One or more curves can be selected by left clicking on any column of the Curves panel. To select multiple curves use Ctrl-click or Shift-click. Selection is indicated by an underlined curve name. Selection of curves is used for bulk deleting, copy operations, and the mask to curve command. A single selected curve is also a requirement for editing of curves within a slice (see below); nodes will not be visible unless the curve is selected. Re-ordering curves list: Curves can be moved up and down the list by selecting a curve and using the Up and Down buttons. This reordering only affects how the curves appear in this list. Deleting curves. Select curves in the panel then use the Delete button to remove them. Figure 18. Curve modes. Note that in Open mode curves have two square end markers, which are specialised nodes through which the curves does not pass, but whose position affects the curvature of the final section. The blue square affects the end with the blue circle, the green square the end with the green circle. When the curve is closed these are treated as normal nodes. 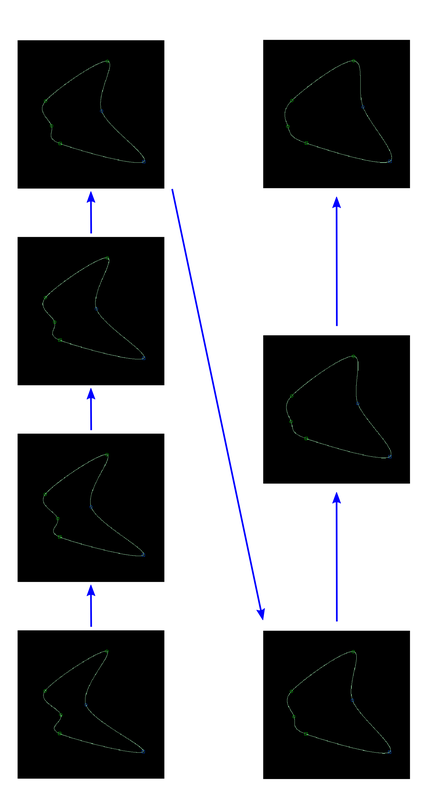 Curves are edited on a per-slice basis by adding, removing or moving nodes. To perform this sort of editing, a single curve must be selected in the *Curves panel, and SPIERSedit must be in curve mode*. Curve editing uses the brush for position, but brush size is ignored. Creating nodes: The ‘=’ key adds a node to the curve at the current mouse cursor position. If no nodes exist for the curve on the current slice, the minimum of 4 are created near the cursor position. Removing nodes: The ‘-‘ key removes a node from the current mouse cursor position. If this would reduce the number of nodes on the slice below four, the user is asked if they want to entirely remove the curve from the slice or not. Moving nodes. Nodes can be moved by dragging with the mouse. Removing curves from slices: curves can be removed from slices by individually removing all their nodes. The Remove Curves from Selected Slices command on the Curves menu provides a quicker way of doing this in bulk, removing all nodes from selected curves for all slices selected in the Slice Selector panel. Curve markers: By default nodes are indicated with small circles, but the Curve Markers as Crosses setting on the Curves menu changes these to small crosses, which some users may find clearer. Locked curves: If the Lock curve shape item on the Curves menu is ticked, dragging any node will move all nodes of the curve rather than an individual node. Resizing curves: The Resize curves on selected slices command on the Curves menu lets the user resize all selected curves on all selected slices by a specified percentage. Curves can be copied between slices using the copy commands in the Curves menu. This works in a way completely analogous to copying masks; the reader is referred to the masks section for more details. Curves can be interpolated between slices; if, for example, slice 10 and slice 20 have nodes defined for a particular curve, interpolating between these slices will gradually alter the curve in between the two to form a smooth shape change from one to the other. Figure 19 (overleaf) shows a curve interpolated over seven slices. To interpolate a curve between slices, ensure that the curve is selected in the Curves panel, that all slices involved are selected, and that the curve has the same number of nodes on the first and last slice selected. The Interpolate Over Selected Slices command on the Curves menu performs the interpolation. There is no need for nodes to already exist on the intervening slices, but if they do they will be over-written by the interpolation operation. Defining filled curves at regular intervals (e.g. every 50 slices) and then interpolating them is a fast way to rather precisely specify regions to be masked, and is a technique the authors make extensive use of. As intimated in previous sections, an important use of curves, especially interpolated curves, is to draw masks. 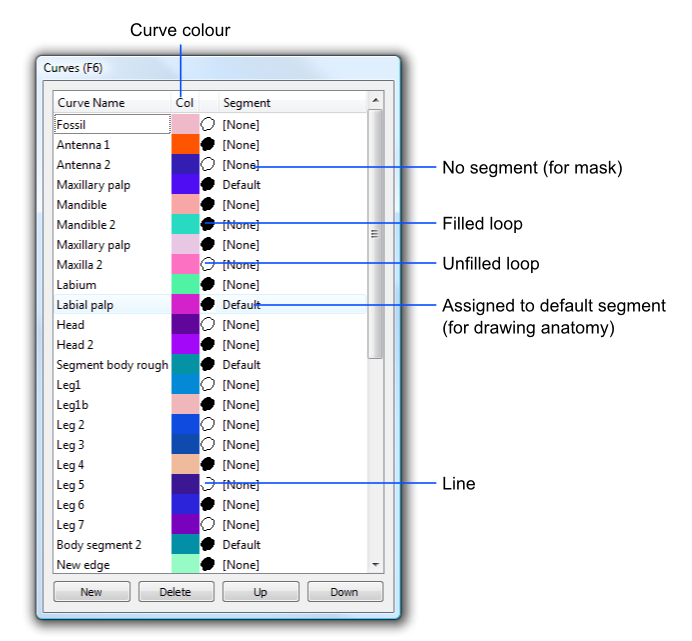 To create a mask from a curve or curves, select the curve (or curves) in the Curves Panel, select the slices involved in the Slice Selector panel (it doesn’t matter if slices are selected on which the curve does not exist, so often it’s fine to use the Select All button here), and select the mask which the curve is draw into in the Masks panel. To trigger the operation use the Mask from curve command in the Masks menu. All pixels from the curves on all selected slices will then be drawn into the selected mask. While curves in any mode can be converted into masks, in almost all cases the curve should be in filled mode to specify an area rather than just an outline. Typically it is easier to set up the mask in unfilled mode, and then put it into filled mode before performing the Mask from curve operation. Creating a mask from a curve is a one-time copy operation, which does not create any sort of permanent link. If the curve is later modified, the area masked by a Mask from curve operation based on it will not update, and the masked area and the curve will no longer be in synch.